FOLLOWING ITS world premiere production last year, the smash hit sell-out show Guerilla Days in Ireland is now coming to the Town Hall Theatre. It tells the gripping story of Tom Barry, legendary commander of the IRA’s West Cork Flying Column in the War of Independence. The play is adapted by Neil Pearson from Barry’s classic memoir, Guerilla Days in Ireland, published in 1949 and one of the finest first-hand accounts of this momentous period in Irish history. 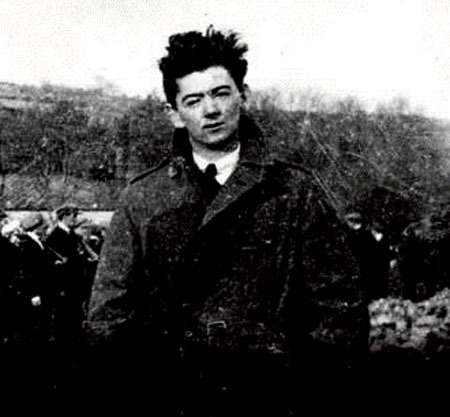 Tom Barry was born in 1897, in Killorglin, Co Kerry, where his father was an RIC policeman. A few years later his father left the police and the family moved to Roscarbery, in Cork, and it was here and in Bandon that Barry grew up. In 1915, aged just 17, Barry’s thirst for adventure saw him enlist in the British army and head off to the Great War where, serving in the artillery, he saw action in Egypt, Palestine, Russia, Italy and France. It was while he was fighting in Iraq that Barry first heard of the Easter Rising, which was to become the pivotal moment of his life. In 1920, soon after his return to Cork, Barry joined the IRA. His leadership skills and military acumen were quickly apparent and he soon rose to the rank of Commander of the Flying Column. Barry’s West Cork Brigade became famous for its discipline and efficiency while he himself gained a reputation as the most brilliant field commander of the war. The British army stationed more than 12,000 troops in Cork during the war while Barry’s forces numbered little more than 300 yet eventually Barry’s tactics made West Cork ungovernable for the British authorities. Guerilla Days in Ireland features Brendan Conroy as the older Tom Barry and Aidan O’Hare as the younger, and completing the cast are Michael Grennell and Jack Walsh. The play runs at the Town Hall from Tuesday, September 11 to Saturday, September 15 at 8pm nightly.